The Seca 700 Pound & Kilogram Model ~ Height Rod Included! Platform Size 14.25" x 13.25"
Scale Size 61.2" x 20.5" x 20.4"
Easy To Use Weight BeamsOnce the scale is set up, weighing will be a very simple task. All ya need to do is step on the medical scale, slide the larger weight to the approximate weight area, then do some fine tuning with the smaller weight. You'll want to keep manipulating the smaller weight until the hand and counter-hand, on the right side of the balance beams, line up. 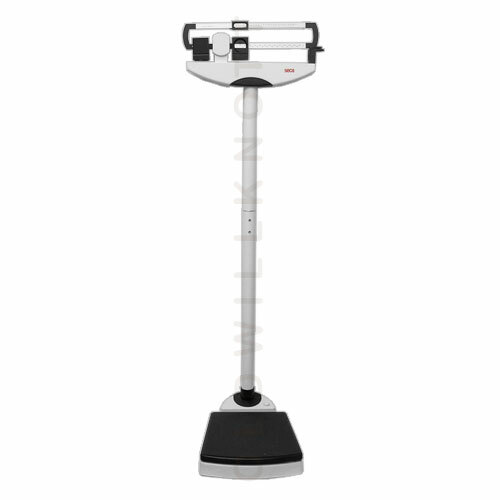 Height RodThis professional scale comes complete with the Seca 220 height rod, turning it into the ultimate measuring station. Tare And Fine Tuning KnobsThis mechanical doctor scale has a tare knob on the bottom of the large sliding weight, and a fine tuning knob on the side of the beams, that lets you set the balance to zero before you weigh. This can come in handy for accurately measuring weight even with a weighing pad on the scale. Easy TransportationSeca equipped this hospital scale with rolling castors on the rear of the platform to help ya move it from place to place without taking it apart. No Batteries HereYou won't have to ever worry about running out of battery power, or trying to find a wall outlet, with this beam scale. This scale's two beam design allows you to accurately weigh patients, in as small as 1/8 pound graduations, without a digital readout. 5 YEAR MANUFACTURER'S WARRANTY!Seca offers a five year warranty against defects in materials and workmanship. In the rare case ya have a problem with this scale, contact Seca for a repair or replacement. This scale was exactly what I was looking for. It has both pounds and kilograms (my wife uses lbs, I use kg). Assembly was trivial and took about an hour. All the wrenches were included, including the allen wrench to zero out the balance. The longest time was just coming up with the zero balance, which only took about twenty minutes on a flat surface. The only problem I had was figuring out the height adjustment. It is not... immediate obvious which hole needed to be screwed in, but the diagram was accurate (just look carefully for the model). This scale doesn't have a sweet spot (where the weight changes if you lean back and forth) which is why I purchased it. In that aspect, it is perfect.